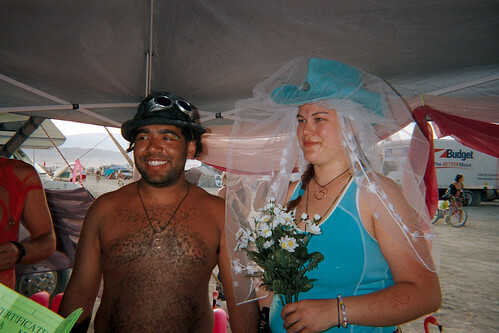 Photo by Meesh, before her Burning Man wedding, Tuesday, 2009. 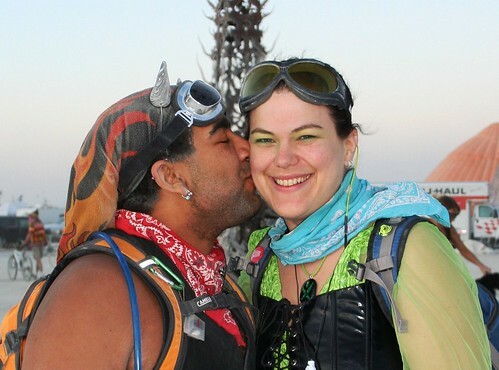 A little over a year ago, it was my love Random’s first Burning Man, and my third trip there. Towards the end of the week, Random and I were passing by a theme camp that performed weddings. “Hey! Would you like to stop and attend a wedding reception? This couple will be getting married in a few minutes,” a man said. “Sure, why not!” was our reply. And the man who goes by Blue Buddha married us, with me being given away by my “father” (dressed as Peter Pan), and Random standing beside his “best man” (Peter Pan’s boyfriend, wearing a collar and leash and body painted with flames on his chest). The ceremony was deemed valid until the alcohol or novelty wears off, or until we leave the playa (the dry lake bed where the event is held). But we called each other husband and wife only until we removed the plastic wedding rings in Reno with a touch of sadness. Our relationship grew even stronger after we traveled and spent the week in the desert together without hating each other by the end of it. I was pretty sure after that, we could survive anything that came our way. We finally stopped driving up and down the state constantly (kinda) when he moved in. 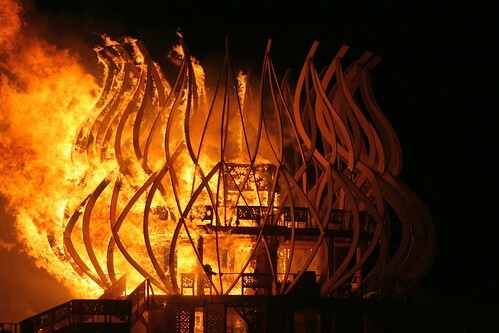 We made plans to return to Burning Man again, participating in a fire performance group from Philly. 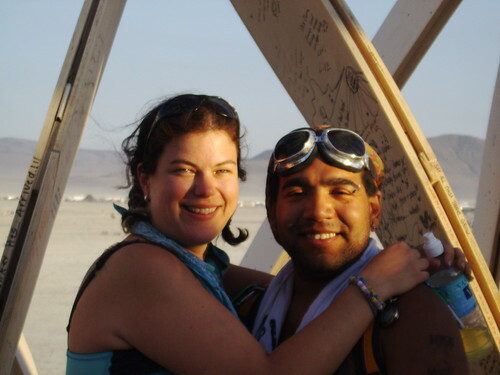 And so it came to be a Thursday at Burning Man in 2009, when I asked Random “Was it Thursday when we were married last year?” Because, no matter how we try to journal and keep track of what happens at Burning Man, it’s always a lost cause. He thought it was Thursday or Friday. I was definitely favoring Thursday, and we decided we’d just assume that was right. We had just returned to camp from an afternoon jaunt which included a stop at Whiskey and Whores, catching up with our friend Calamity Joe. Our anniversary and we stopped by the camp that married us! We camp with Homebrew for a Homebrew, a great group of mostly locals and Reno residents who like to brew or drink beer. This year, we had two art cars owned by camp members. The Tiki art car was Sledge’s car, and he asked if Random, Big Rig, Elaina, and myself wanted to go on a ride. 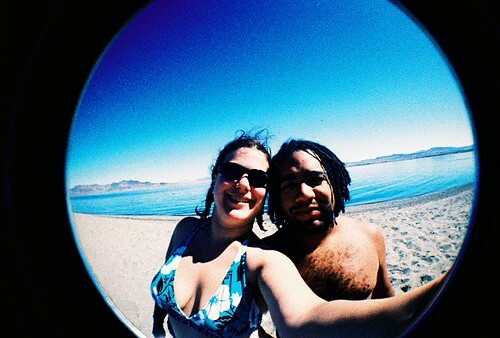 (Big Rig and Elaina are friends of ours from the regional Playa del Fuego, where we met and fell in love, who were virgins to Black Rock City and camped with us.) Since we were well prepared to jump up and go (if you say no to an opportunity there, you may never get it again! 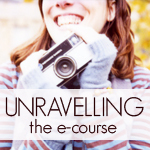 ), we said sure – where to? “Anywhere. Just a little ride around,” Sledge answered. It was a cool late afternoon, with the sun setting and very little dust. We rode out heading towards deep playa, and ended up pulling up to the Temple. Sledge had been out there before, but construction was still finishing and no one was allowed in the structure yet. We had been there before as well, but it had only just been opened to the public so it was very crowded, and we didn’t wait to go on the upper-most level as we had friends from Camp Jersey waiting for us. The Temple this year was a beautiful lotus shaped design with laser-cut panels in all kinds of intricate designs. By Sunday when this art would burn, the walls would be covered with inscriptions from the many visitors who leave memorials, questions, fears, wishes, wisdom, love, and shouts of joy. As we all split up to explore the Temple, Random and I wander up to the top level that we didn’t visit before. I sensed he was acting a bit differently, but I just figured it was the mood/moment he was in. It was romantic, looking over the city towards the Man, the sun setting to our right, a wedding being performed on the ground level below us. I said “let’s walk to that side”, and we went to face south-east, towards Groovik’s Cube (a large interactive Rubick’s Cube art piece). We kissed, and he said he wanted to spend forever with me, and I said so did I. He said “then let’s make it official” and yes, he got down on one knee, and saying my full name, he asked me to marry him. I think I said “of course, yes” in some combination, I was a little shaky. He had a wooden ring, hand carved by our friend Calamity Joe, which he said was a temporary ring until we got home to the real ring. 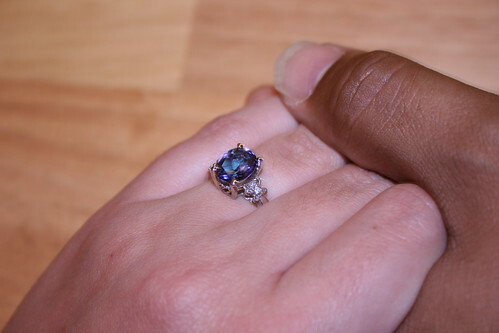 It fit perfectly, and was worn next to my playa wedding band that we wore again only for Black Rock City. As we were kissing and glowing, I asked someone to take a photo only to realize it was Marcus from our own camp! At the same time Big Rig came up to us and showed that he sneaked photos of us while we were kissing. Thanks Big Rig and Elaina for the pic! I asked if he had heard what happened, maybe he had known or watched while it happened, but no. And so they were the first two to hear the news of the engagement, followed by Elaina, Sledge, and Twinkly Dots (my Reno friend/hostess/rockstar), who by playadipity* passed us on our way back to camp. Thanks Big Rig and Elaina for the pic!! 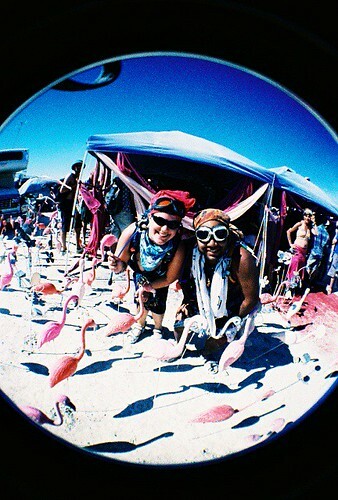 * playadipity: serendipity that only happens on the playa of Burning Man. 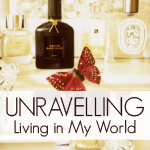 Somehow it is much more common and much more miraculous all at the same time there. The ring that is way too small yet managed to fit my finger for just an evening, before going to the store for resizing. Peacock Topaz, a treated version of my birthstone that has a great range of purples and blues! So for now, the real ring (it’s beautiful!!) is being resized and I still wear the wooden ring, slightly dinged and dusty but oh so much more precious than any jewel. There’s no one else I’d rather spend forever with, and I can’t wait to share every adventure with him.